Have you spotted our #Muralbikes yet? 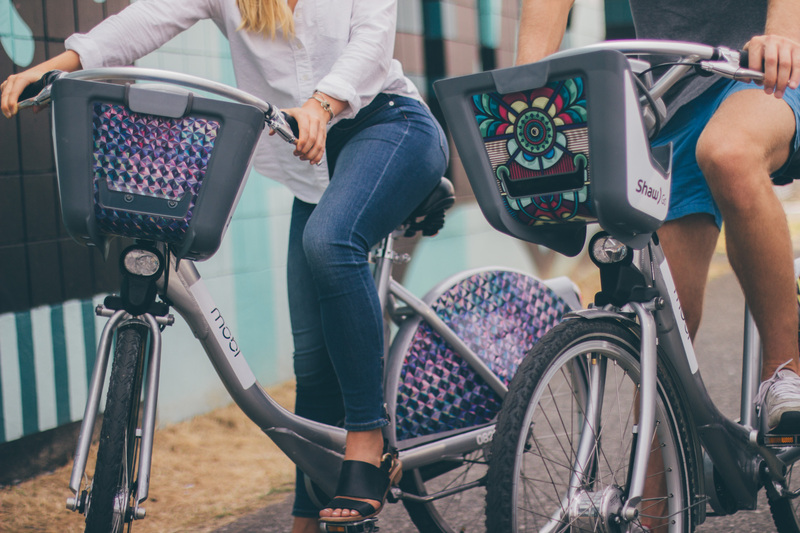 Last year during Vancouver Mural Festival (VMF), we asked four Vancouver-based artists to design 19 Mobi by Shaw Go Mural Bikes. The designs remained on the bikes for the entire year and they quickly became fan favourites! So this year, we asked four new artists to add some colour to our bikes for the 2018 VMF. We have left 1 bike blank for YOU to design. Submit your design here. Vancouver Mural Festival is the city's largest annual free public art celebration. The festival brings together local artists who will be creating 50 new large scale murals throughout the Mount Pleasant and Strathcona neighborhoods. Have you ridden one of our 2018 mural bikes yet? Danielle is a mixed media collage artist who creates simple / narrative compositions using found images, a few strokes of paint, and a whole lot of humor. Danielle is the writer behind the contemporary art site, The Jealous Curator, and the author of “Creative Block”, “Collage”, “Your Inner Critic Is A Big Jerk”, and “A BIG IMPORTANT ART BOOK - Now with Women”. “At some point over the past few years, Queen Elizabeth has become my muse in the studio. For some reason taking her out of the palace and putting her into everyday situations brings me pure joy, so when I had an opportunity to cover a Mobi bike with my artwork, clearly Liz had to come along for the ride. In these two pieces, and for the walls I'm painting at the Vancouver Mural Festival, I allow the space / shape I’m given to help create the story. Liz really does the rest”. Fenders: “Between the fenders and her brolly, liz was all puddles schmuddles, y’all”! Front: “Word on the street was that liz loathed bubblegum - clearly 'the street’ hadn’t heard about ROYAL RASPBERRY XTREME”. Paul comes from an artistic family of the Haisla-Heiltsuk Nation, of Kitamaat and Waglisla, BC. He is currently a Muralist and Indigenous Arts Facilitator working in and around the Vancouver and Burnaby areas. Paul says, “my cultural and spiritual prayers are answered when I can create energies for goodness using my abilities. When I close my eyes, I will be deeply grateful”. “The challenge and gift of art is using and balancing all the spaces to create positive design vibrations. Our peoples, almost all Traditional Northwest Coast First Peoples, put designs on things of everyday function and items specially designed for ceremony. The Mobi by Shaw Go bike is an everyday-use ride with clean, green, Vancouver fun energy. The designs represent the air, mountains, motion, and the B’gWan’m (person) coming through”. Taking inspiration from a wide variety of sources, Paul is an avid bird watcher, musician, and traveler with a special interest in Africa. His interests in zoology, geography, history, literature, and exploration have led him on many journeys including canoe expeditions in the canals of northern Europe and walking safaris through the East African savannahs. Here we see Andrés Segovia, the well known Spanish guitarist in his studio, which lacks actual walls but retains his pictures and framed awards and windows. He’s kept company by his cat, Buttons and seems to be practicing his guitar to an audience of Goliath groupers who swim around the giant octopus who supports the entire concert. Famous travel writer, Bruce Chatwin, on his bicycle, accompanies a troop of kangaroos and clusters of levitating rocks as they maneuver through stands of ancient termite mounds in the Australian outback. The title refers to Chatwin’s book the Songlines which is a semi-fictitious chronicle of his search for meaning in spiritual landmarks of the Australian Aboriginal people. Samuel Beckett referred to the bicycle and rider as the Cartesian Centaur because it is like a mathematical and contemporary version of the mythical Centaur—half man, half horse, but in this case half man, half bicycle. Beckett himself is doubling André the Giant who was his real-life neighbour in rural France. They are cycling through a kind of purgatory, where pollard willows (symbols of death) and storks (symbols of life) tend the spirit bottles which dot the trees and landscape. Ciara works primarily as a tattoo artist at Sticks & Stones Tattoo, which they own and operate. Ciara's work is inspired by their Indian heritage and by scientific illustration. Their tattoo style is heavily focused on black linework and creating works that flow with the anatomy of the client. The decals they designed for Mobi by Shaw Go encompasses Ciara's interest in floral illustration with their stylistic inclinations as a tattooer to create dramatic flow and rhythm. They chose to work with chrysanthemums and peonies as motifs because of their significance to Indian, Tibetan, and Buddhist art.